Bartimaeus rises from his seat by the roadside and began to cry loudly, "Jesus, son of David, have mercy on me!" HE TIME HAD come again for the Passover Feast at Jerusalem, and Jesus knew that his life on earth would soon be ended. He took his twelve disciples aside from the crowd which followed and told them again that soon he should be given into the hands of the chief priests and the scribes, his enemies, and he condemned to die. But the disciples could not understand; for they believed surely he was the son of God and that he would become the king of the Jews. Two of his disciples, James and John, came to him soon afterwards, bringing their mother. She knelt before Jesus and asked him to grant places of honor to her sons when he should receive his kingdom. But Jesus knew these disciples and their mother did not understand that the kingdom of heaven would not be like an earthly kingdom, and he said that places of honor would be given only by God the Father. As the crowd passed along the street, a blind man named Bartimaeus, sat by the roadside begging. He heard the sound of many footsteps and he wondered why such a crowd was passing, so he asked the reason. And some one answered, "Jesus of Nazareth is going by." Bartimaeus had heard about Jesus of Nazareth. He had probably heard about the man who had been born blind and who had been healed by this wonderful man from Nazareth, in Galilee. Now he wished that Jesus would have mercy on him, too, so he rose from his seat by the roadside and began to cry loudly, "Jesus, son of David, have mercy on me!" Jesus knew about the poor beggar, and he knew how the men near by had urged him to keep still. 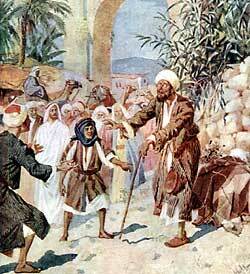 Now he stopped and commanded some one to tell the blind man to come to him. So a messenger hurried to Bartimaeus, saying, "Be of good comfort, for Jesus has heard you and now he is calling for you." And Jesus asked, "What do you wish me to do for you?" "Lord, give me my sight," he asked. Jesus answered, "Go your way; your faith in me has made you well."